The Caldecott Favorites by Scholastic Storybook Treaures® is a wonderful addition to our educational home library and it showcases many award winning Caldecott Medal winners. There are 20 wonderful stories included with this 3 DVD set and it features many of our family favorites such as The Snowy Day, Caps for Sale, The Story about Ping and Bear Snores On. Ezra Jack Keats is one of our favorite authors so we were delighted to discover this DVD gem which has stories that we were not yet familiar with such as The Trip and A Letter to Amy. On the second DVD, there were delightful animal stories that had my children and I laughing out loud such as Bark, George and In the Small, Small Pond. Finally, the heartwarming and timeless tales of The Ugly Duckling and Angus and the Ducks really captivated my young children. 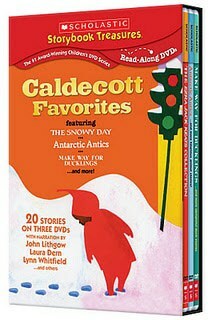 The Caldecott Favorites highlights stories that focus on honesty, humor and respect and it is presented to children in such a way that they don’t even realize that they are learning. This DVD collection is recommended for ages 2 through 9 and it was a big hit with my own children who are ages 4, 5 and 6. I use these stories in our home school curriculum but my children will also specifically request to watch a show in the evening during quiet time too. The Scholastic Storybook Treasures® DVD collection features read-along captioning which is perfect for my four, five and six year old early readers. Scholastic Storybook Treasures® also promotes early reading skills with read-along DVDs. I have noticed an improvement in my six year old son’s reading abilities since he began watching this series and I love that he tries to read the text along with the narration. Our collection of Scholastic Storybook Treasures® is an excellent resource for our home school curriculum because it is not only entertaining but educational too. You are invited to visit the New Kideo website to purchase Caldecott Favorites on DVD (SRP $24.95) or to view the entire collection of Scholastic Storybook Treasures® titles.